In addition to regular readers of Jo Nova, those familiar with John Cook’s misleadingly titled website “Skeptical Science” may be shocked by what follows. Some will also likely recall Jo’s article; Robyn Williams shreds the tenets of science. It largely covered the awful Robyn Williams interview of Bob Ward of 2/Oct/2010, and resulted in strong ridicule of the ABC going viral around the world. 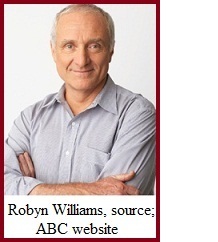 Well, lo and behold, Robyn Williams, presenter of “The Science Show”, remains in true form, and continues to defy the ABC’s Editorial Policies on impartiality etc. The audio and transcript is available here, and at close on 19/May it had an unusually high 77 comments in rapid time, including many complaints. In comparison, the other five uncontroversial stories on that same show only attracted 8 comments in total, and that infamous Bob Ward interview totaled 38 comments. However, early on 20/May, all comments and the facility to make comments disappeared, just as things were hotting up. Then, four days later, it all came back, without any explanation or apology, but the momentum of so many inconvenient comments seems to have stalled. Authors John Cook and Haydn Washington analyse the approaches of those who deny climate science. 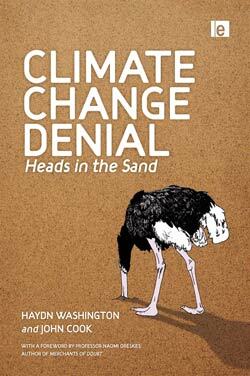 Despite multiple lines of evidence pointing to the same conclusion, deniers continue to deny. Cherry picking is one tactic. Another is the use of fake experts or scientists who are not climate scientists. The authors explore why, as the science firms, the public view, at least in Australia, is going the other way. Robyn Williams: …when we are talking about the East Anglia email scandal, there were three, possibly four enquiries, and each one found in favour of the scientists in terms of the scientific evidence. But that seems not to have stopped denying at all. John Cook: Yes, there has actually been eight independent investigations into it, and they have all found the same results. So it’s almost like climate science where we have multiple lines of evidence finding the same conclusion. But conspiracy theories are very popular amongst any group that wants to deny a scientific consensus. He claims to be an environmental scientist so should know that chimps are biologically close to humans, including emotional stuff. Even dogs are observed to dream, and suffer badly from separation anxiety etc. Chimps clearly have not learnt societal “closure” mechanisms like us, such as burial ceremonies, so do they deny grief? I think it is far more likely that the mother does not know how to handle what’s happened, but can surely recognise, not deny, that something ain’t right. (but then I’m only a mechanical engineer). However, there is a listing entitled “900+ Peer-Reviewed Papers Supporting Skepticism of “Man-Made” Global Warming (AGW) Alarm” at Popular Technology.net, that is rather difficult to count on two hands. [Perhaps Cook has a lot of fingers? -- JN ] Some of the journals employed are not popular with alarmists though, including GRL for example. (The Climategate Emails revealed plans to change the editors of GRL, for committing the sin of publishing some sceptical papers alongside with mainstream.). John Cook: No, I think the general sticking point among sceptic qualified scientists is they tend to hang their hat on this proposition that negative feedback will cancel out the warming that we cause, it’s like a get out of jail free card. But the main argument against that is when we look back through Earth’s history, that has never happened before, there has always been positive feedbacks of amplified warming. Well, radiative energy fluxes are variously determined in recent times, (aka EMR or electromagnetic radiation, which BTW is not HEAT), but such spatially and temporally very complex data cannot possibly explain if increasing CO2 has caused it. That’s not quite right, for instance, the petition was compiled before that new term for CAGW was invented. Also, the following breakdown of the scientists includes the disciplines which are foundation to various fields of “climate science”. Robyn Williams: Who are these scientists nonetheless? Are they scientists? 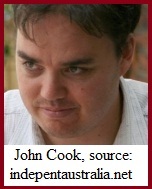 John Cook: Most of them probably are scientists. There are a few funny names there, I think Posh Spice might have been on there or somebody. But what they are, are mechanical engineers, medical doctors, and the point is when you have a technical and complicated subject like climate change, you want to get the opinions of climate experts. So, for example, if you were going to get a heart operation, you wouldn’t want a mechanical engineer cutting into you, you would want somebody who was an expert on that. Robyn Williams: …and also went to a fascinating place where they are actually showing climate models in action. You know, you’ve got a screen above and a screen below, one is the model showing weather patterns lines, streaming out according to the model, and the other one is the actual weather being shown from a satellite, and they are exactly the same. It’s quite remarkable. The models I think have been portrayed as being unsophisticated, bodgy, and computer crunching, in fantasyland, but in fact they are unbelievably exact, aren’t they. Haydn Washington: …our civilisation evolved in 8,000 years of stable climate, so we have never had to adapt to a rapidly changing climate. Obviously he is a non- believer in the MWP, and the collapse of some civilizations that has been strongly attributed to climate change. The most recent big one I believe was the Khmer-Angkor great city civilization drought some 500 years ago, that has been attributed to monsoonal changes whilst coming out of the LIA. If you listen to the 17 minute audio, or read the transcript, (link repeated), there is more head-shaking stuff, but I’ve kept it brief. An interesting aspect is that this makes the sixth book of exclusively alarmist genre that Robyn Williams has reviewed since declining to review Bob Carter’s highly acclaimed new book, at the time of the Bob Ward attack. (more info here). The authors say that they are doing a special parliamentary edition signed by two important Oz politicians, (John Hewson, Bob Carr), and seven climate scientists, to be sent to every federal member. The book also has a foreword by Naomi Oreskes.